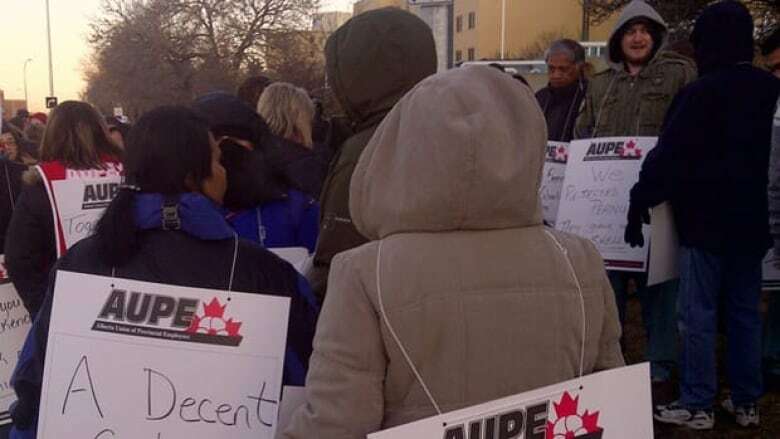 A one-day walkout by health support workers in Edmonton has ended and AUPE has agreed to send the contract dispute with Alberta Health Services to binding arbitration. A one-day walkout by health support workers in Edmonton has ended and AUPE has agreed to send the contract dispute with Alberta Health Services to binding arbitration, health officials announced late Thursday afternoon. "Staff involved in the wildcat strike should be back at work within two hours," said Chris Mazurkewich, chief operating officer and executive vice-president with Alberta Health Services. The agreement between AUPE and AHS guarantees that workers will not be disciplined or face legal action for walking off the job on Thursday. In a news release, AUPE President Guy Smith called on workers to return to work immediately to "ensure they are protected." Hundreds of service workers at Edmonton's Royal Alexandra Hospital started their strike at 7 a.m. Thursday. They were followed by about 40 workers at the University of Alberta Hospital and others at the Northeast Community Health Centre. Managers soon started performing duties like meal delivery, portering and room cleaning. The job action forced the Royal Alexandra Hospital to cancel about 68 procedures. Mazurkewich says those procedures will be rescheduled immediately. AHS officials scheduled a hearing with the Labour Relations Board on Thursday afternoon to force employees back to work. But an agreement to start binding arbitration was reached with AHS as the hearing began. Negotiations are set to start next week. The walkout caught union leaders by surprise, pre-empting a series of rotating information pickets scheduled for Thursday around the province. About 22,000 General Support Services employees have been negotiating with Alberta Health Services after their contract expired last spring. General Support Services employees manage health records, prepare meals, manage finances, maintain facilities, assist in therapy, sterilize surgical tools, assist pharmacists and provide security. In January, the workers' bargaining unit rejected a mediator's contract recommendations by an overwhelming 95 per cent, prompting Alberta Health Services to come back to the bargaining table, said the union. The two sides met last week to resume negotiations. "We were very hopeful a fair agreement could be reached with AHS last week, what we got was nothing short of insulting," Smith said in a press release. "AHS's final position was even less than what was recommended in the rejected mediator's report." AUPE walked away from mediated negotiations last week, after AHS tabled an offer of a two-per-cent lump sum payment for 2011, a two-per-cent increase for 2012 and a cost of living increase for 2013, said Joanna Pawlyshyn, vice-president, Royal Alexandra Hospital. The negotiations are the first for the service workers since the amalgamation of the province's health regions in 2009. AUPE is Alberta's largest union, with almost half of its 80,000 members working in health care.